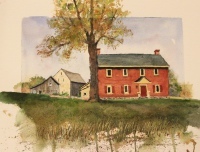 Bruce Poulterer’s watercolors reflects his love of farmhouses, buildings, still life and historic structures dotted throughout the Pennsylvania, New Jersey, and Delaware countryside. In addition, Bruce has painted extensively throughout Latin America, Europe and the US. Bruce paints with a love and zeal that reveals his gratitude to God for allowing him to paint and share this love with others. Bruce has been a watercolor artist for over 39 years. Originally trained at Franklin & Marshall College; Bruce went on to study under numerous realistic watercolor artists in PA, DE, VT, NY and NJ, including Karl Kuerner III at the Karl Kuerner Farm. Bruce often hosts one-man shows, in additiona to juried Art shows, including Historic Yellow Springs Art Show, Brandywine Art Festival, Malvern Retreat House Art Show, Audubon Estate Plein Air, Chadd’s Ford Art Shows, Church of the Good Samaritan, Brandywine Valley Plein Air Juried Event, etc. In addition, Bruce has painted Christmas cards and limited edition reproductions for 20 years, which has taken his artistic creations to every state in the US, throughout Latin America, and in many countries in Europe, Asia, and the Pacific Region. Bruce helped organize this event honoring the 100th birth of Andew Wyeth held at the Brandywine River Museum for 20 members of the Philadelphia Watercolor Society. This Plein Air event was very successful and raised money for the Chadds Ford Historical Society and the Brandywine River Museum. Some of Bruce's watercolors are contained on this website. Bruce was honored by Dressage at Devon Horse Show to do their first limited edition reproduction to raise money for Cancer Research for Children’s Hospital. He was also selected to do the same for Penn State University’s Food Science Building and donated his original watercolor that hangs in the lobby above the Creamery at Penn State’s Food Science Building. The MACSA Art Annual Competition, watercolor class including demonstrations for 4 years, GSV Art Club watercolor demonstrations and one of his greatest joys is donating his art to non-profit organizations so as to enable fund raising opportunities to worthy causes. Request Bruce's brochure that describes "Turning an Idea into a Watercolor Painting"